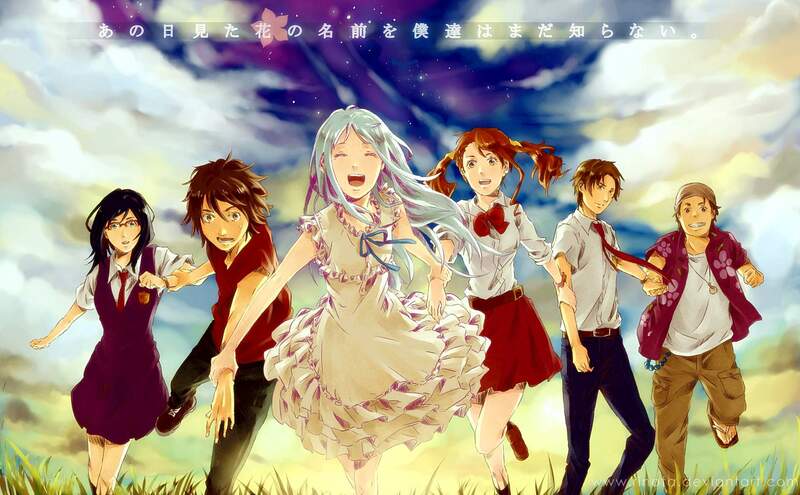 A group of six sixth-grade-age childhood friends drifts apart after one of them, Meiko "Menma" Honma, dies in an accident. Years after the incident, the leader of the group, Jinta Yadomi, has withdrawn from society, does not attend high school, and lives as a recluse. One summer day, the ghost of an older-looking Menma appears beside him and asks to have a wish granted, reasoning that she cannot pass on into the afterlife until it is fulfilled. At first, he only tries to help her minimally because he thinks he is hallucinating. But since Menma does not remember what her wish is, Jinta gathers his estranged friends together once again, believing that they are the key to resolving this problem. All of the group joins him, though most of them do so reluctantly. However, things grow increasingly complicated when his friends accuse him of not being able to get over the death of Menma, for Jinta is the only one who can see Menma's ghost and his friends think he is seeing things. But as matters progress, it is realized that Jinta is not the only person in the group who is having trouble letting go of the past and later then Menma shows her presence to the group to prove that she is indeed real. It is revealed that all of the group members blame themselves for Menma's death and long-hidden feelings are rekindled. The group struggles as they grow from trying to help Menma move on and help each other move on as well. Anohana: The Flower We Saw That Day (あの日見た花の名前を僕達はまだ知らない。 Ano Hi Mita Hana no Namae o Bokutachi wa Mada Shiranai., lit. “We Still Don’t Know the Name of the Flower We Saw That Day.”) is an 11-episode 2011 Japanese anime television series produced by A-1 Pictures and directed by Tatsuyuki Nagai. The anime aired in Fuji TV’s noitamina block between April and June 2011. 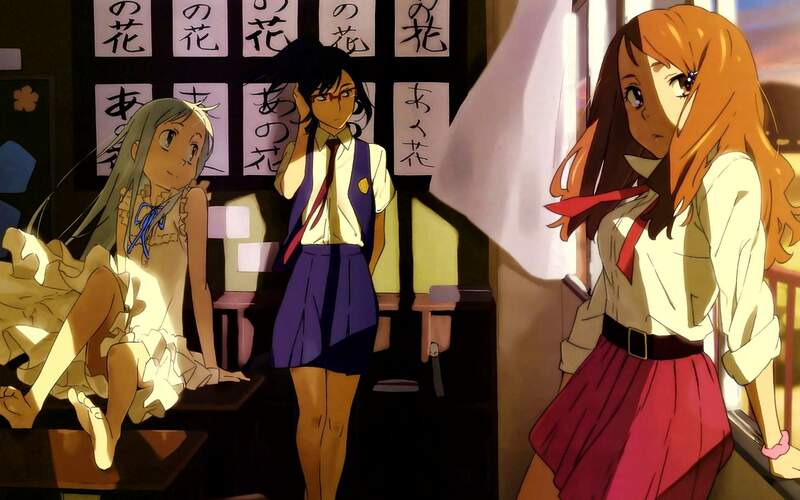 Anohana: The Flower We Saw That Day is one of my favorite slice of life anime. This show is just one of those feel-good type of anime, but it also may make you cry. You will be bombarded with a rainbow of emotions. Anohana animation is both gorgeous and vibrant. Anohana music is beautiful and upbeat. This anime has one of the best opening and closing themes, which is always a plus. This series introduced me to one of my favorite band, Galileo Galilei, which did the intro theme “Aoi Shiori” (青い栞 Blue Bookmark). I can not get enough of the ending theme either, “Secret Base ~Kimi ga Kureta Mono~ (10 years after Ver. )” by Ai Kayano, Haruka Tomatsu, and Saori Hayami. The character design, both visually and written wise, are top notch. The characters are believable and lovable. We see how each of them deal with their grief and eventually overcome them. I highly recommend this anime to everyone that like a deeper anime experience. I would suggest you have a box of tissue ready. Anohana contains a tiny amount of suggestive themes and dialogs. Appropriate for young teens.